Cwm Berwyn Walk at Tregaron01970 612125workWalking Route1. From the Talbot Hotel, turn right and walk up past the turning to the new pay and display town car park. Continue out of the town until you reach a white bungalow on the right called Llygad-y-rhiw. Take the next left after this (dead-end road) and cross a bridge over a small stream. holloway, now mercifully clear of gorse bushes. Continue along this (now running along a broad grassy ridge divided into fields), and through a gateway and a metal gate. A final rusty gate marks open country ahead. 4. Follow vehicle tracks and past a rusty field gate to your right, over boggy ground to reach a further gate in a boggy corner. Go through this to stay in access land (it swaps to the right-hand side of the fence line here), and continue ahead following the line of a greasy, stony “stream” until you are roughly level with farm ruins of Bryn-coch on the left. Fork right over open ground towards a clear green path leading diagonally uphill until you are roughly level with a few trees surrounding a ruined barn to your right. Veer right towards these, initially on pathless ground, crossing a peat leat before a wire fence. Shortly after this, a vague sheep track emerges leading out of access land and just right of the farm ruins. 5. Follow narrow walled track beyond the farm ruins, then head for a lone tree in the far right corner of the field. Pass through a ruined gateway beside this, continue ahead with a ruined wall/further ruin on your right. Keep going in roughly the same direction, as the fence line bears off downhill, now on a much wider, clearer green track which heads downhill to the left of a ramshackle dry stone wall. As the track bears left, continue downhill to Pantshiri Cottage. two buildings on the far side of the river, follow the faint path as it heads for a gap in the trees ahead, to cross another tiny side stream. 8. You now need to climb the hill to a point where the gradient eases (roughly 100m above an intentionally made gap in the dry stone wall) before crossing the wall. Go through a gap in the dry stone wall roughly 15m above a couple of fencepost in the wall. 9. Now follow the vague line of an old dry stone wall, bearing left and uphill towards a ruin, crossing an awkward valley by a couple of large boulders. From just below the ruin, head for an obvious (from below!) track-line leading to a hurdle in the fence. Negotiate this and continue to the left, cutting through a gap in an embankment at the corner of the fence line. 10. Descend diagonally downhill to the top of a stony path (stream) heading directly towards a gateway (low point in the garden fence) diagonally below. Cross this, following stream to cross a wooden bridge. Head left (waymarked) up some stone steps, bending right to a small wooden gate. 11. Head uphill on the road and continue steeply uphill to reach the Forestry Commission* (see note at beginning of the description) turn for Cwm Berwyn plantation. Take the forestry road (permissive path) right, and continue along the main forestry track past the viewpoint. Continue along the main forestry track for roughly 2km, following the occasional white permissive path signs. 12. Fork right at a junction on a bend left , onto a more minor forestry track, which bends left at a further fork very soon after. Follow this track to its end, then bear right onto a rougher path (way marked permissive path) which rapidly trades a stony surface for rough boggy grass. Follow this to the edge of the forestry and go through a wooden gate onto open moorland. towards these, and the summit of the grassy mound ahead. From here, head towards the right hand end of a band of pine forestry below you, and through a gate roughly 50m right of this. 14. Follow a wide boggy track downhill. Shortly after a house (right) and vehicle track (left) is a newly signed bridleway on the left. Take this, crossing the stream and through a wooden gate. Follow the now (briefly) stony path, bending left just before a metal gate. Turn right onto a tarmac road past Gwndwn Melyn to reach a dirt track heading towards Glangors. Follow this to reach a metal gate, then bear left over a tiny brook and immediately right between two fences. Continue straight ahead on this bridleway, passing through a two metal gates to eventually reach a tarmac track. Cross this track and through the rusty gate on the far side, aiming ahead to an old concrete track. driveway by a cattle grid. 16. Cross the stile and turn left along this driveway, then right onto the road by the fire station below. Continue along this road back into Tregaron. Terrain: Mostly rougher terrain, but a complete mix from rough pathless upland, through bridleways across fields to sections of tarmac/concrete track. Road-walking section at start/end of route. Suitable for: Fit walkers. Dogs on lead around livestock. 1. From the Talbot Hotel, turn right and walk up past the turning to the new pay and display town car park. Continue out of the town until you reach a white bungalow on the right called Llygad-y-rhiw. Take the next left after this (dead-end road) and cross a bridge over a small stream. 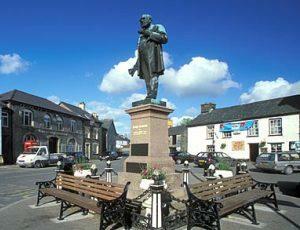 Tregaron is on the A485 Aberystwyth to Lampeter road. The town is passed by the NCN 82, Lon Cambria and Lon Teifi cycle routes.